Exclusively Here! Autographed by Steve Nison! 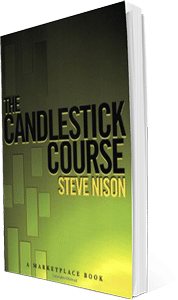 The Candlestick Course is a hands-on course book that will help you master Steve Nison’s landmark techniques. Each chapter gives you specific learning objectives, key terms, clear instruction, and real-world applications of the concepts. Plus, each chapter ends with a review quiz, allowing you to perfect your charting abilities before moving on to the next phase. The Candlestick Course is for everyone. Novices will appreciate that it starts with the basics. Experienced traders will find that each chapter’s lessons will help test, sharpen and refine skills as they navigate today’s volatile markets. The Candlestick Course is a terrific companion to Nison’s other educational books and video workshops. Yet it also stands alone as a wonderful introduction to the power of candle charting. Visual candlestick “glossary” identifies and explains at-a-glance important patterns. and quick refresher course, time and again.